Crossley, a company that specializes in retro-styled electronics, has introduced a new jukebox-style iPod dock, the iJuke. The $199 dock looks just like a classic jukebox, except that it’s 18″ tall. We tend to go for more minimal docks – ones without percolating bubbles. But the neon lighting and mahogany cabinet tempered our gag reflex a bit. What do you think – iJuke or iPuke? Let us know in the comments…..
Crosley has married our legendary classic jukebox with the modern-day technology of today to create the iJuke. The iJuke is a real treat for the eyes and ears and is sure to become an instant household favorite. 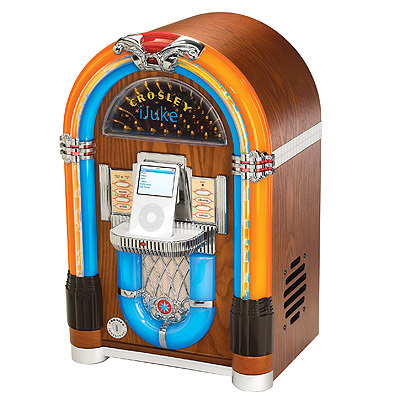 The iJuke allows you to connect your iPod and add hours of listening pleasure to your jukebox experience in any environment. The dynamic full range stereo speaker compliments the small but powerful iPod-enhanced jukebox. And for some extra eye candy the iJuke comes complete with authentic neon lighting and percolating bubble tubes to really get you rockin‚Äô and rollin‚Äô. Eek! Hon’, we’re definitely not getting one of those to replace your grandparents’ Victrola. I’ve got one and I love it. It was $88.00 at Target!!! It will go great on the bar of my 50’s decorated basement! the ijuke is really cool, it has great sound quality and the neon lights look so amazing in the dark…..